I'm happy to report that I'm knitting for pleasure full-time again. The last couple of months have been a little dicey with some extra-curricular knitting , but I'm safely back on the fast track to a more relaxed (deadline free) knitting schedule, at least for the time being. This weekend I'll be zoning out on stockinette and getting reacquainted with The Swisher. I love picking up an in-progress project after its fallen off the radar for a few months. In a way, it seems brand new again - this time there's only half a sweater to knit, though. Kind of feels like cheating. Don't mind me, I'll be the one happily knitting in the corner. Great looking colors! I like how they blend together. You are so right about falling in love again with a long neglected project! I am struck with my tactile memory of the needles and yarn - how strong those memories are when the details of the pattern are still a bit foggy! Hooray for fun knitting! Any chance Demi will come out to play any time soon? I love The Swisher. If a person were to want to make a similar top-down raglan but didn't know how to do it, how would you advise a person to proceed? Yes, I'm all about the stockinette zone-out! I tend to put projects that are no longer seasonally appropriate away and then take them out the following season, and like you said, voilà, you have have a sweater to finish. Brilliant. i feel the same way...except sometimes its tough to remember exactly what routine you had goin' on. this project is especially nice with it's interesting color comination. How is that Swish to work with? I've eyed it before, but never bought any. I'm doing a striped project, too, and I love it. My only concern is whether or not the stripes are wide enough to be flattering, but not so wide that I look like a crafty escaped inmate. And those are gorgeous colors together. Like wine and, well, more wine (which is only a good thing). I love your choice of colors, just lovely. 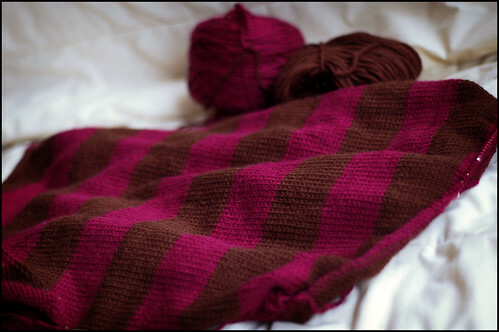 Enjoy your weekend, and may it be full of leisurely knitting! these stripes are so good. enjoy the stockinette land.... very relaxing! and i agree about picking up an old abandoned project. i've just done that with 2 sweaters and they feel so close to being done now! You said it All, baby. i am diggin these colors so much! Ah, stripes and stockinette. That's like the meatloaf and mashed potatoes of knitting...so simple, yet so satisfying. Have a great weekend with the knitting! Great perspective on picking up UFO's. I love it, too! I love those colors together, they are so striking.